National Developmental Disabilities Awareness Month 2019- During the month of March, The Arc Mid-South hosted events to raise awareness of the challenges encountered by individuals who have intellectual and physical disabilities. Read more. The Arc Mid-South 23rd Annual Awards and Benefit Gala. The Arc Mid-South would like to thank all the generous sponsors, contributors, members, volunteers, guests and staff for your support! Read more. Highlights from the Americans with Disabilities Act celebration held on July 26th. Read more. Highlights from 3rd Annual International Tea: Thanks to everyone who attended our International Tea and Fashion Show at the Kroc Center! The event featured delicious food from around the world, dazzling performances from global entertainers, and a fashion show featuring the latest trends from Dillard's. Read more. "I Matter" Workshop: The legal and financial options available to youths with disabilities as they become adults were explored at The Arc Mid-South’s 3rd annual “I Matter” conference on April 14. Achieving A Better Life (ABLE) accounts are the newest tool that Tennesseans with disabilities have, thanks to federal legislation passed in 2014. ABLE accounts are a simple, less expensive alternative to special needs trusts and pooled trusts that can be used in conjunction with those planning tools, attorney William King Self said. Read More. 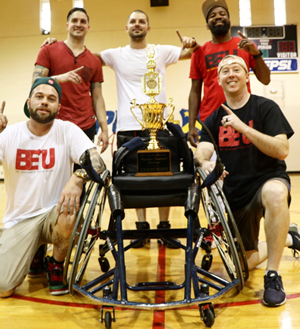 Wheelchair-basketball tournament: Congratulations to BeU Clothing, who defeated Cardinal Health’s Olive Branch Cardinals to win its third championship in our annual wheelchair-basketball tournament at Skinner Center. Thanks to the Rollin’ Grizzlies, Hamilton High cheerleaders, our sponsors, volunteers and all those who came out and helped make the March 24 event a great success! Job Readiness workshop: Proper attire for job interviews, business etiquette on social media, and time management were discussed when about 200 students with disabilities from Shelby County Schools attended The Arc Mid-South’s job-readiness workshop. “Make sure you’ve got it all together,” urged Rhonda Treadwell, executive director of Dress for Success Memphis. Good grooming – clean teeth, face, hair and nails – is essential preparation for a job interview as is conservative dress, she said. Read More. Disability Day on the Hill: More than 30 people joined The Arc Mid-South on Feb. 14 in traveling to Nashville to lobby state legislators to support two bills that would affect people with disabilities. Read more. Self-Advocacy Brunch and Discussion Forum: Individuals with disabilities can achieve their goals if they put their minds to it – that was the message that more than 40 people heard when they attended The Arc Mid-South’s Self-Advocacy Brunch and Discussion Forum at the Central Library. “Don’t say ‘dis’ to me,” panelist Lou Conley said. “I have an ability…You have to change people’s minds about the way they see you….Your disability is a possibility.” Read more. National Disability Employment Awareness Month: October has been National Disability Employment Awareness Month. The purpose of National Disability Awareness Month is to educate about disability employment issues and celebrate the many and varied contribution of Americans workers with disabilities. Read more. 22nd Annual Awards and Benefit Gala: Awards & Benefit Gala on September 30 drew almost 300 participants and 55 generous sponsors to a fabulous evening at The Guest House at Graceland, raising thousands of dollars for our programs and services. Read more. Highlights from 3rd Annual International Tea. Global foods, fashions and entertainment were celebrated at The Arc Mid-South’s 3rd Annual International Tea & Fashion Show, held at Kroc Center. Read More. What happens to a special needs child after high school ends, he/she turns age 18 and becomes an adult? The Arc Mid-South recently held the second annual “I Matter” conference at the University of Memphis about the legal issues that young people with disabilities face as they transition into adulthood. Judge Kathleen Gomes from Shelby County Probate Court spoke about conservatorship, which is one way parents can legally manage their child’s legal, medical and educational affairs after he or she turns age 18. Elderly parents need to request that their grown children or another trusted person be granted the power of attorney before the parents become incapacitated, attorney Ruby Wharton cautioned. “Don’t wait until it’s too late,” such as after the parent has had a stroke and is incapable of making decisions, she said. Attorney Robert Donati shared his expertise with Social Security. Supplemental Security Income (SSI) is granted after the government agency examines a child’s level of functioning and determines that he/she is severely impaired physically or mentally. Social Security Disability Insurance (SSDI) is available to claimants with disabilities who have paid a sufficient amount into the Social Security Trust Fund. A question-and-answer session let audience members get individualized answers to their most pressing questions. For more information about the topics discussed, please contact The Arc Mid-South at (901) 327-2473. In 1987 President Reagan proclaimed that March was “Developmental Disabilities Awareness Month.” The deinstitutionalization movement of the 1970s and early 1980s had laid the foundation for significant social change, and the presidential proclamation urged Americans to provide the “encouragement and opportunities” necessary for people with developmental disabilities to reach their potential. In recognition of the commemoration, The Arc Mid-South has held several events. On February 8, members of The Arc Mid-South attended Disability Day on the Hill in Nashville. Read more. On March 9, high school juniors and seniors with special needs attended a Job Readiness workshop. Read more. The Arc Mid-South hosted its annual Wheelchair Basketball Tournament on March 11 featuring the Memphis Rollin' Grizzlies, members of the National Wheelchair Basketball League. Read more. More than 200 supporters attended the 21st Annual Awards & Benefit Gala at Hilton Memphis Saturday. Thanks to all of the volunteers, sponsors and auction donors who helped make The Arc Mid-South’s major fundraiser such a success! Read More. Volunteer Advocacy Project - this 12 week program trains volunteers to become special education advocates who can provide instrumental and effective support to families of children with disabilities. Read More. National Disability Employment Awareness Month. Read More. Parent/Caregiver Trainings with STEP Inc. Read More. The Arc Mid-South thanks all of its supporters who attended our 2nd Annual International Tea and Fashion Show on September 17th. Read More. The Arc Mid-South’s advocacy staff and a group of self-advocates met on August 24 with U.S. Rep. Steve Cohen to discuss a few issues that are important to the disability community. Read More. July 26th 2016 - The Americans with Disabilities Act proved to be a revolutionary tool that strengthened the U.S. workforce, made society more inclusive and improved the lives of millions of people with disabilities. That was U.S. Atty. Edward Stanton’s assessment, shared at the 26th anniversary celebration of the federal law’s passage. His speech was one highlight of the gathering at Memphis City Hall, which was sponsored by The Arc Mid-South. Read More. "I Matter"Conference: The Arc Mid-South recently educated a packed room at the University of Memphis about the legal and educational options available to young people with disabilities as they transition into adulthood. Read More. Thanks everyone who made our annual “Hoops from the Heart” Wheelchair Basketball 2016 such a big success. Read More. On January 27, 2016, The Arc Mid-South had the opportunity to attend Disability Day on the Hill in Nashville, Tennessee. Read More. Kamp Tiger 2015. Read More. The Arc Mid-South hosted its “Creating Independence….Supporting Literacy” 65th Anniversary and Benefits Gala on October 17th at the Holiday Inn University of Memphis. Read More. A Camp to Remember! Read More. The Arc Mid-South celebrated the 25th Anniversary of the Americans with Disabilities Act (ADA) with its own parade in downtown Memphis on July 22, 2015. Read More. The Arc Mid-South hosted its first “Tea around the world,” International Tea and Fashion Show Extravaganza on Saturday, May 9th at the Crowne Plaza East. With over 200 guests in attendance, this event was a huge success. Read More. “Hoops from Heart” Annual Wheelchair Basketball Tournament 2015. Read More. Prestigious Award - Four Star Award, We are extremely proud of this award again this year! Read More. The 2014 fall session of the Volunteer Advocacy Project was hosted on Monday mornings from August to November. Read More. The Arc Mid-South celebrated National Disability Employment Awareness month on Friday, October 31st. Read More. The University of Memphis men’s basketball team enjoyed a day with The Arc. Read More. The Arc Mid-South at the “Awards of Excellence” Banquet hosted by Tennessee Community Organizations (TNCO). Read More. Folks had a great time enjoying the music and laughter at the Sweetheart Ball held on Feb 8 at the weekend retreat at SOS. Parents and caregivers got the chance to visit and enjoy one another's company as their loved ones enjoyed the party. Click here to see pictures from the event. Disability Day on the Hill! A photo of one of our staff members, Monicia, is pictured with her sister, Stephanie, in this article!! Click here to read "My First Tutoring Session at The Arc Mid-South"
by Stephanie Turner, 29, of Bartlett was crowned Mrs. Tennessee International and will go on to compete for the title of Mrs. International 2014 during the final competition in Jacksonville, Fla., July 22-28. Turner, a pharmacist, volunteers for many local organizations and will continue to support The Arc Mid-South and SRVS as her platform during her reign as Mrs. Tennessee International. She has an adult sister with Down syndrome and knows firsthand the issues adults with disabilities face. She plans to advocate for more resources for adults with disabilities. The Arc Mid-South Executive Director Carlene Leaper was recognized again at 2013 TNCO Annual Awards for Excellence as TNCO's Community Leader of the Year.